Oliver was the brother of Oakes Ames, and involved with him in the famous Credit Mobilier scandal. He served as acting president of the Union Pacific RR from 1866- 68, succeeding John A. Dix, and as a director until his death. Few men were better known in the industrial world during his time. 1871, New York. 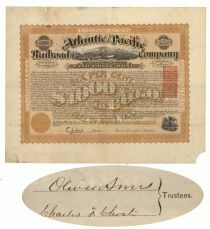 $1000 Central Division Land Grant bond of the Atlantic & Pacific Railroad Co. bearing 6% interest. Rust/Black with orange imprinted revenue at right. Large panoramic view of mountains with steam locomotives and a riverside town. Signed on verso as Trustee by Oliver Ames (1807 - 1877). Manufacturer, Railroad promoter and official. Brother of Oakes Ames and involved with him in the famous Credit Mobilier scandal. Paper loss at lower right corner well away from border, would mat out nicely, otherwise fine. Uncancelled.